Lightweight, contour fit construction, unbreakable carbon front pole clip, and all stainless and billet mounting hardware. 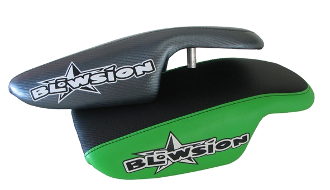 Closed cell foam padding with your choice of custom colored "glove fit" Blowsion upholstered chin pad cover included. Fits 96-current yamaha Super Jet, All Polaris Octane, Yamaha FX1 and Blowsion Kawi 750 Sxi and 800 SXR pole conversion kits. This is the BOSS of chin pad replacements available- not some universal-fitting cheesy peice of fiberglass w/ turf on it.